Photographs of geometrically shaped trails of high-energy particles ejected from two pulsars as they zip through the Milky Way galaxy have helped scientists better understand why the two objects emit very different kinds of light. Pulsars are a type of neutron star that forms following a supernova explosion, when a massive star collapses in on itself. Pulsars spin at varying speeds, and some of them emit steady beams of light. As the pulsar spins, its light beam may sweep across the Earth, acting like the beam of a lighthouse, creating the illusion that the pulsar is blinking on and off. Known pulsars in the universe radiate light primarily in two different wavelengths: radio waves (the lowest-energy form of light) and gamma-rays (the highest-energy form of light). Despite the similarities between the two pulsars, Geminga emits a strong gamma-ray signal toward Earth, but no bright radio emissions, while B0355+54 is a bright radio emitter with no gamma-ray emissions. Using the Chandra images of the particle trails, the researchers determined that the particle emissions show that this is just a trick of perspective: The radio emissions from Geminga are pointed away from Earth, as are the gamma-ray emissions from B0355+54. A spinning pulsar rotates around an axis, just like the Earth, with poles on opposite sides of the spherical object, and an equator belted around its midsection. These new images from NASA's Chandra X-ray Observatory capture the emissions of two nearby energetic pulsars called Geminga and B0355+54. "Both pulsars have magnetic poles quite close to their spin poles, as is the case for the Earth's magnetic field. 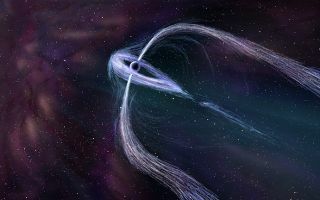 These magnetic poles are the site of pulsar radio emission, so astronomers expect the radio beams to point in a similar direction as the jets," NASA officials said in the statement. A "likely [correct] interpretation" of the Chandra images of Geminga and B0355+54 is that the narrow particle trails seen coming from each object "represent narrow jets emanating from the pulsar's spin poles," NASA officials said in the statement. Geminga's narrow band of particles has been pushed behind the pulsar as the star speeds through the Milky Way. After examining the new images, the scientists concluded that Geminga's radio-emission jets are pointed out to the side, explaining why they don't pass over the Earth. "Both pulsars also contain a torus of emission spreading from the pulsar's spin equator," NASA officials said in the statement, describing a flattened donut of particles wrapping around the pulsars. "These disk-shaped structures and the jets are crushed and swept back as the pulsars fly through the [Milky Way] galaxy at supersonic speeds," the statement said. The gamma-ray emission from a pulsar is "mainly produced along the spin equator and so aligns with the torus," the statement said. While Geminga appears to be oriented such that its gamma-ray emission is visible to astronomers on Earth, the opposite seems to be true of B0355+54. Astronomers see the bright radio pulses from B0355+54, "while the torus and its associated gamma-ray emission are directed in a perpendicular direction to our line of sight, missing the Earth," according to the statement. "These two deep Chandra images have, therefore, exposed the spin orientation of these pulsars, helping to explain the presence, and absence, of the radio and gamma-ray pulses," NASA officials said.